Summer fast receding in the rear-view mirror, I’m doing my best to turn my attention back to writing and all things literary. 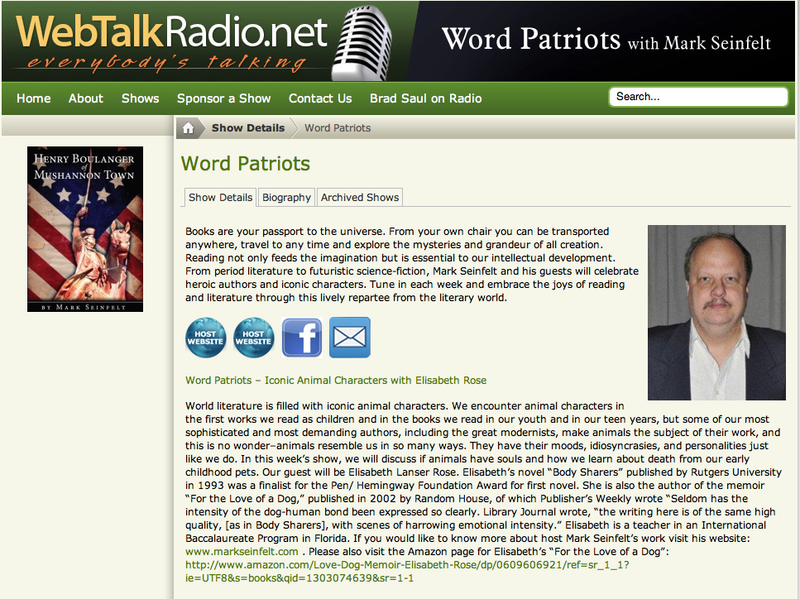 While I was giving in to summer’s distractions and the demands of a home made chaotic by renovation, Mark Seinfelt soldiered on with Word Patriots, creating great webcasts with compelling writers week after week. The following is a summary of what Mark and his guests have been up to. To hear these programs, visit: http://webtalkradio.net/shows/word-patriots/. Yours truly returns for a show devoted to past masters, heroic word patriots who overcame great obstacles, who wrote in new and innovative ways, or who defied convention by visiting formerly taboo topics and thereby opened new fields of exploration for literature. On this show, Mark and I discuss the compositional techniques of William S. Burroughs, the author of “Naked Lunch,” “The Adding Machine,” “Nova Express,” and “The Western Lands” and too many more works to list. Big Bad Bill is one of my literary heroes (anti-heroes?). We discuss Burroughs’ influence on my own work and how I employ a variation of Burroughs’ famous cut-up and fold-in technique. Noted poet and naturalist Diane Ackerman joins Mark to discuss her most recent book, One Hundred Names For Love, which came out in April 2011. In the book, Ackerman tells the story of a stroke suffered by her husband, novelist Paul West, in 2004. Diane relates how frightening and frustrating the stroke proved for Paul and how devastating it was for her to witness Paul’s ability to communicate taken away, his essential self amputated. Diane also tells how she helped Paul find his way back to himself, how she threw a life jacket out to that dark place without words for Paul to grasp onto and drew him back to the light., a feat as heroic and epical as Proust’s recapturing of lost time. Mark discusses the importance of reading the classics and the poetical works of John Milton with John W. Moore, Jr. John is an Associate Professor Emeritus of English and Comparative Literature at Penn State. Mark’s gues is my guest is Barbara Michel, the author of seventeen books. She is a graduate of the British American School of Writing. Several of her novels have won first-place awards at writers’ workshops and conferences. Her “Colorado Blaze” entry won a national award in “The Writers’ Digest” 2006 contest. New Englander, WW II Navy veteran, footballer, wrestling coach, and pick-up baseball player, Edgar H. Knapp, 89, is exuberance personified, a remarkable and wonderful teacher, a man who has had a life-long love of poetry. He attended Lawrence Academy and Wesleyan University and later taught at Groton and Penn State. In 1965, he edited a small volume of poems for study in secondary schools entitled “Introduction to Poetry.” Later he served as general editor of a four volume series with Harcourt Brace—“Ideas and Patterns in Literature.” He has shown his enthusiasm for theoretical criticism and aesthetics in essays on Gerard Manley Hopkins and John Barth. His essay on Barth’s novella “Lost in the Funhouse,” “Found in the Barthhouse: Novelist as Savior” initially appeared in “Modern Fiction Studies,” and thereafter was reprinted four times, most handsomely beside the Barth story in “The Process of Fiction,” edited by Barbara McKenzie, Harcourt, 1974. Since his retirement from teaching, he has penned the engaging autobiography “B- in the course,” which former United Nations Ambassador Jonathan Moore characterizes as “very funny. The eye and pen of the writer perceive comedy naturally welling up throughout life’s adventure.” Finally, Ed is also the author of a number of “long forgotten birdsongs” or “fun children,” as he calls his poems. Some have been published in literary periodicals. Others he has sprinkled at turns in his autobiography, as one does “Parmesan cheese on spaghetti.” Recently he has collected a selection of his poems in the self-published chapbook “To Troy And Back.” Mark says that Ed has the best pipes for poetry of anyone he knows. His declamatory recitations are mesmerizing, and his love of poetry simply infectious. Word Patriots beget Word Patriots. In addition to his poems—his fun children—Ed is the father of eight flesh-and-blood children. His daughter Jacqueline—also a lover of the written and recited word—has followed in her father’s footsteps as artist and educator. A New York-based actress, Jacqueline has a busy resume, from Broadway (Brian Friel’s “Dancing at Lughnasa”), to film (“Dominick & Eugene,” “You Don’t Know Jack”) to primetime TV (“Law & Order”) to serving on the board of the acclaimed Actors Studio. She is also something of a regular at the Caldwell Theatre in Boca Raton, where she appeared in the James Joyce bioplay “Himself!” and as the Italian-speaking housekeeper Costanza in “Enchanted April.” She is also a faculty member at The Actors Studio Drama School at Pace University, a three-year graduate program for the theatre arts, which grants MFA degrees in acting, directing, and playwriting, and where James Lipton serves as Dean Emeritus. Mark interviews both Edgar and Jacqueline, and the two perform works by Walt Whitman, Vachel Lindsay and Edgar himself. Mark’s guest is Ray Goss, the author of the memoir “Misadventures in Broadcasting: Zany stories from 50 plus years of sports play-by-play.” Ray recalls some of the off-beat, unusual, incredible, humorous, and at times embarrassing experiences that have occurred over the last half century while he was broadcasting sports events throughout the country. He narrates many more such amusing incidents in his 2008 book “Misadventures in Broadcasting.” He hopes the reader will enjoy reading about them as much as he has enjoyed writing about them. Jonathan Maxwell, author of “Murderous Intellectuals: German Elites and the Nazi SS” which explores why so many well-educated professionals willingly joined the Nazi Party as well as the broader topic of genocide in human history.